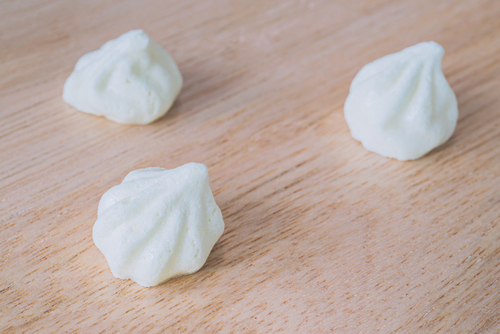 Meringue prepared in a kosher for Passover kitchen, is kosher for Passover, no matter who you go by. It’s pretty much just egg whites and sugar. Scrape in some vanilla bean seeds, throw in some chocolate chips, and if the weather’s not too damp, you get amazing meringue kisses that it’s difficult to stop eating. Of course, if it’s humid or it rains, make something else. Meringues don’t like humidity. They just don’t come out right. Eat the same day. They don’t keep and cannot be frozen. But such a delightful treat!! Gradually add sugar, one tablespoon at a time, making each tablespoon of sugar is incorporated completely, before adding the next. Slit open the vanilla bean pod vertically, with a sharp knife. With the tip of your knife, scrape the interior to remove the moist vanilla bean seeds. Add to egg white mixture. Drop kisses by heaping teaspoons, well apart, on two parchment paper-lined cookie sheets. As you drop the kisses onto the cookie sheet, pull the spoon up to make attractive peaks. Bake for 25 minutes or until peaks of meringue are beginning to brown, and sides of kisses feel dry to the touch. Cool on racks, then peel kisses off parchment paper.